Structure Elements can now be grouped. The Editor can much easier find and insert the needed element. Developers can group the elements which are related. Placeholders can allow a whole group instead of particular elements. Administration is simplified this way. If you work in AxCMS.net and don't see the groups - consult your developer. 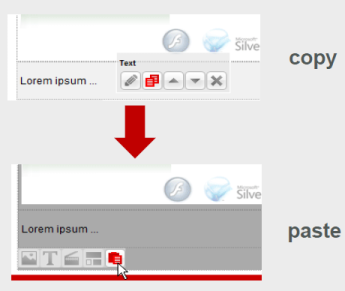 You can copy objects on a page and paste them into another placeholder on the same page (or into the same placeholder). Nested structure elements can be copied as well. 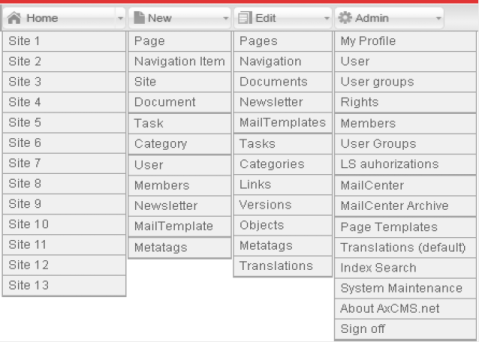 Menu Items under „Edit“ and „Admin“ are more logically distributed and named. "Versions" and "MetaTags" are now under Edit. "User/User Groups/Rights" and "Members/Member Groups/LS Rights" under Admin. Editor can define a favicon - for every Site separately. 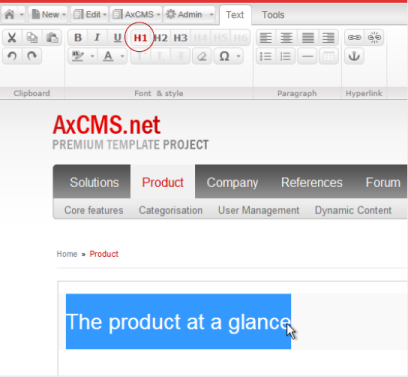 Upload the icon a sa document in AxCMS.net and attach to the Site. Favicon is used by browsers, e.g. in the URL-line and in the bookmarks/ favorites. Read more about favicon. In earlier versions if you publish a category, the whole subtree of this category is published, which is sometimes not wishful. Now you can publish a single category without touching its subtree. Use the publish-button on the category/navigation detail page for it (not in the overview). 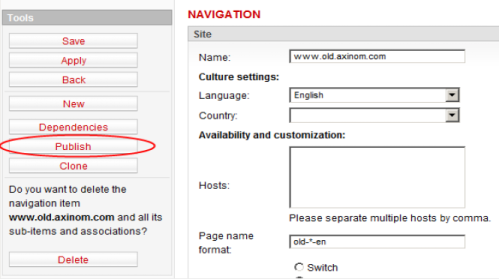 If you publish a Site, it published the site-related information and the Site root navigation node. Editor can apply a Css Class or an Image Format to an inserted image directly from the content editor. Insert the image: upload a high-resolution file, select an small image format, ready. 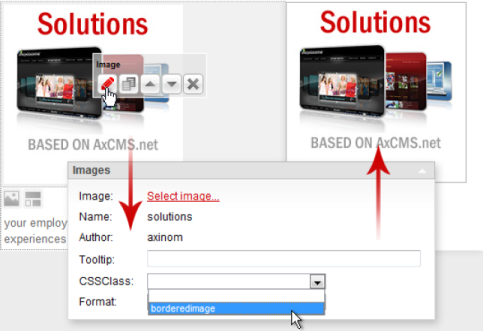 AxCMS.net takes care of resizing the image. Same with CSS formatting. If publishing fails, Editor sees now not only a general error message, but also the reason for the failure. It will help troubleshoot typical problems without searching for published exceptions. For detailed problem description, please consult your administrator. He should setup exception management and find the exception related to the error. How do you know if an object on a page is checked out by someone? Go with a mouse over it and you see a red border around it. If you click on the edit-button, a message appears, that tells you, who checked out the object. You can review all checked out element (and even check them in, if you have administrator rights) under Edit / Objects.